One thing that has always set Samsung apart from its competitors is their ability for self-appraisal, and being in competition not only with other companies but also with themselves. Their intra-model competition is more stressed-upon than inter-company, and this is what adds to their level of excellence. Their two latest offerings in the Grand series of mobile phones is one such example. Both these models were launched within a short span, and anyone scouting for new cell-phones should pay attention to differences in their features. Even though the models are different, one cannot help but admire the level of quality in both. That being said, however, there are marked differences between the two that must be noted. The design, along with the screen size of these two phones is likely to make some of the best differences, and help you to choose the right option, as per the needs and requirements. The 5.0 inches screen of Grand Prime and 5.2 inches of the Grand 2 can create a significant difference. Both come with multi-touch function, although their resolutions differ slightly. The Prime offers a resolution of 540x960 pixels, whilst Grand 2 offers a 720x1280 pixel resolution. Whenever there is a comparison of grand prime vs grand 2, camera is likely to play another pivotal role, just like others. • Camera features: Both cameras have LED display variety and have same pixel-count. Their front cameras are 5 MP and rear cameras are 8 MP. • They both have high-functioning camcorders which offer the option of video-calling, though Grand 2 has a slightly more complex set of features. • Geo-tagging, exposure compensation and auto-focus are features that both models share, but Grand 2 has added options of night mode and self-timer. Let’s check out the technical segment, when there is a comparison of grand prime vs grand 2. • Hardware: Both phones share the same kind of system software that is Qualcomm Snapdragon, but their core and graphics processors vary a little. Grand 2 seem to be a little more advanced than Prime in this respect. They both have same built-in storage of 8 GB and have the option of expandable external storage device up to 64 GB. 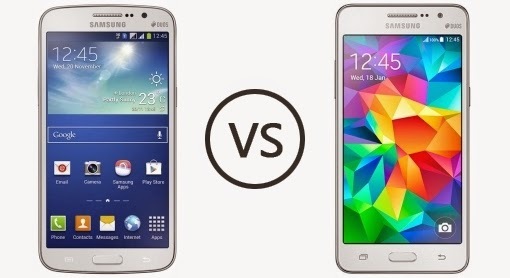 • Battery life: Both the phones have an impressive battery life of 17 hours without necessary charging. However, you must note that this varies from user to user. Grand 2 has an approximate standby time of 15 days, whereas no such function is recorded for the Prime. Both the above mentioned phones are well-rounded devices and not just restricted to a certain fraction of society. A photography enthusiast or budding musician can make good use of the camera and recording functions, while a busy professional can use the office options in the same phone. There is literally ‘something for everyone’. This is true for all of Samsung’s offerings, most of which are not target-specific, but these two phones in particular seem to be directed towards the younger generation. You should make your choice according to your requirement.